It’s time to place your bet on the biggest game of 2019. The Super Bowl 53 betting line for the matchup between the Los Angeles Rams and the New England Patriots has been released, and the line is currently receiving a ton of action and has made the oddsmakers flip the point spread. 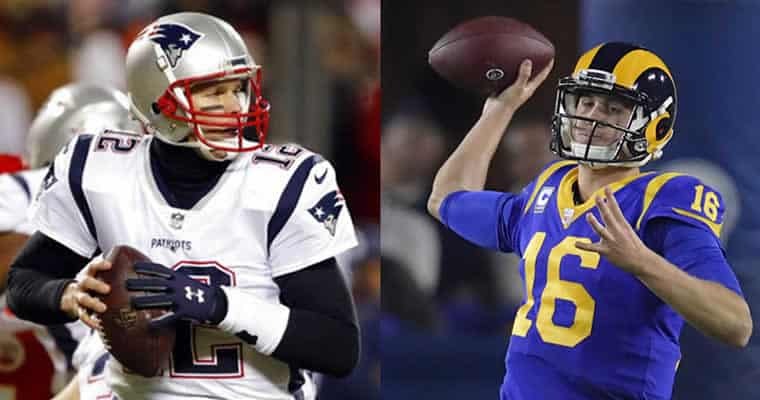 BetOnline opened Jared Goff and the Los Angeles Rams as a one-point favorite over Tom Brady and the New England Patriots immediately following the end of the AFC Conference Championship game. But moments after the initial Super Bowl line came out, the point spread flipped, and the spread now favors the Patriots by one point to take home the Lombardi Trophy on February 3rd. Expect to see a lot more changes in the line as we get closer to the big game two weeks from now. Both the Saints and the Chiefs entered today’s NFL conference championship games as 3-point favorites against the Rams and Patriots, respectively. Additionally, the Saints (+175) entered as the odds on favorite to win Super Bowl 53 with the Chiefs (+275), Patriots (+333), and Rams (+350) rounding out the rest of the field. That all changed after the two thrilling overtime conference championship games were played. In the afternoon NFC Championship, Goff and the Rams came out of the Superdome with an upset victory over the Saints, winning 26-23 in overtime on a game-ending 57-yard field goal by Greg Zuerlein after the Rams safety John Johnson intercepted quarterback Drew Brees on the opening drive in extra time. In the evening AFC title game, Brady and the Patriots left Arrowhead Stadium with a 37-31 victory. Running back Rex Burkhead ran in for a two-yard touchdown after the Patriots won the coin toss and Brady marched the offense down the field for the game-ending touchdown in sudden death—not allowing Patrick Mahomes and the Chiefs offense to take the field after mounting a comeback in the second half. The game features a quarterback duel between a veteran surefire Hall of Famer with Brady and one of the NFL’s bright young stars at the position in Goff. Brady is making his ninth trip to the Super Bowl with the Patriots and will look to further cement his legacy as the greatest quarterback of all time, while Goff will attempt to win the Super Bowl in his first appearance after taking a trip to the big game in only his third season at the helm for the Rams. Super Bowl 53 between the Rams and Patriots will kickoff at 6:30 p.m. ET on Sunday, February 3, 2019. The matchup will be played at Mercedes-Benz Stadium in Atlanta, Georgia, and the game will be televised on CBS.